The Peter Grant series has become one of my favourite current series, the adventures of a Metropolitan Police Constable recruited to be the apprentice of one of Britain’s last wizards had been consistently entertaining over the last four books. The previous book, “Broken Homes”, had ended on the best finale in the series so far as a sudden reversal snatched defeat from the jaws of victory in the Folly’s effort to capture a very dangerous rogue magician. 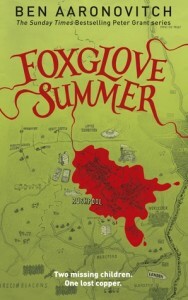 Foxglove Summer picks up the story a few weeks after the end of the previous book but isn’t really a continuation of the story, instead it sees Peter being sent far away to rural Herefordshire to investigate whether there’s any supernatural involvement in the disappearance of two 11-year old schoolgirls. There are occasional references to the ongoing investigation into the Faceless Man and his allies but most of the focus on the abduction case. While it is a little bit frustrating to have to wait longer for the next chapter in the series’ primary plotline I think the book does benefit from focusing on a single case, in the past splitting the narrative between two different plotlines had left the second book “Moon Over Soho” feeling like the weakest entry in the series so far with one plotline far more compelling than the other. There might not be much progress in the case against the Faceless Man but we does get some information about other elements of the background, namely some welcome detail about what happened during World War 2 in Ettersburg, an event that’s been frequently referenced due to its cataclysmic event on Britain’s magical community but one that had only been vaguely referred to in the past. There’s also some good ongoing characterisation for Peter as he has an opportunity to try to heal some of the emotional scars left by the traumatic events in previous books. Most of the characters in the book are new, but there is a return appearance for Peter’s potential romantic interest Beverly Brook and while the appearances by the River families in previous book have sometimes felt a bit disconnected to the main plot I think it works better here. Characterisation has been one of Aaronovitch’s strengths in the series and there are some interesting new characters in minor roles although few of them get much in the way of characterisation. Local policeman Dominic Croft does make a likeable sidekick for Peter although he does seem unrealistically blasé in the face of the revelations about magic. In previous books London has almost seemed like a main character in the stories, this book takes Peter out of his urban comfort zone so there aren’t as many of the asides on local history that featured in his narration of the previous stories with a few scenes showing Peter a bit baffled by the way of life in the English countryside. The abduction case is one of the more interesting mysteries in the series. The tension caused by the girls’ mysterious disappearance is shown both by the panicking families and their differing reactions and by the increasing desperation of the local police force to try to solve the mystery while the local and national press are breathing down their necks. The portrayal of police officers and their investigations in the series has always felt very plausible (aside from the magical elements) and this continues here with the police showing both cynicism and a stubborn determination to do as much as they can to solve the crime. The story all builds to a tense finale and I think the resolution to the plot does work well although it does perhaps a bit rushed towards the end. There are a number of unanswered questions left at the end, I think it is reasonable to leave a number of mysteries particularly in regard to the motivations of supernatural beings but it might have been nice to at least hear Peter’s theories about why events unfolded the way they did. Overall, I’d say this is up there with the best of the series so far although hopefully the next book will feature a return to the series’ main plotline.